On the First Floor is entry with plenty of storage for skis and clubs. Two bedrooms on the first floor. Bedroom 1 has a Queen Bed and is adjacent to the First Floor Bathroom. Bedroom 2 has bunk beds. 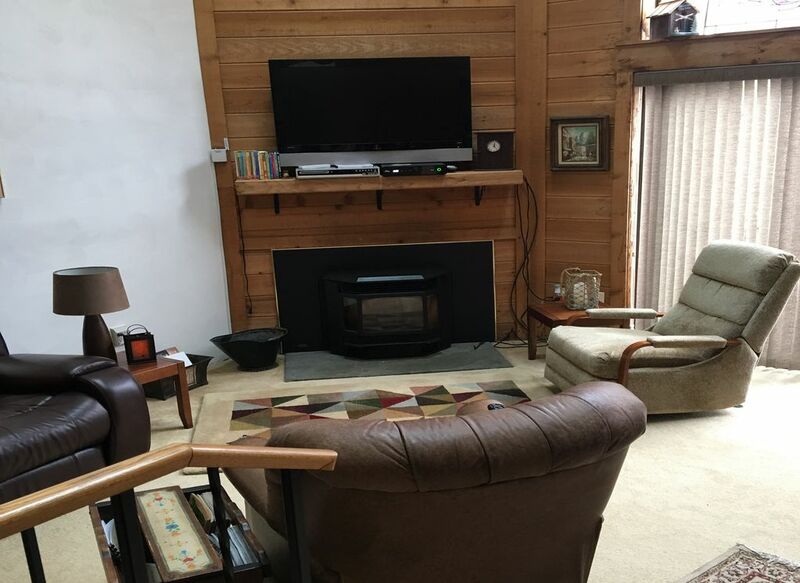 The Living room's highlights include a pellet stove, flat screen TV, leather reclining sofa and chairs, a view of the deck and flows directly into the Newly Renovated Kitchen. The Kitchen includes a table with seating for 8, and Stainless Steel Appliances. It's the perfect Kitchen for cooking while still interacting with guests. The Deck is accessible from the Kitchen and Living room. Deck furniture and a gas grill for cooking out in the warmer months. The deck overlooks the Hidden Valley woodlands that adds to the privacy of the property. Loft includes a Queen Bed, Trundle Bed . The loft overlooks the Living room with beautiful skylights that enhance the wake up experience. Master Bedroom is decorated with a queen bed, flat screen TV and is adjacent to a bathroom. I have always loved this area, and spent much time here over the years. I now get to enjoy the Laurel Highlands year-round as a full-time resident. This is a wonderful place for the entire family every season of the year. The town home is in a resort, and located in a private area near the golf course at the top of the mountain. The home is located in the Hidden Valley Resort. Great resort for children and adults. Championship golf course, skiing, snow tubing, hiking and biking trails. Golf Course is yards away from the home. Home is at the top of the mountain. A 5 minute walk to the slopes, or a shuttle is also available. Kathleen was absolutely wonderful and so was her townhouse! The property was clean, spacious and fully stocked with everything needed for a weekend getaway. We found the walk to the slopes to take no more than 5 minutes, so we never took advantage of the complimentary shuttle. This property was great for our family get together this past week. Plenty of room and comfy furniture to just spend time together. Everything we needed was already in the condo, Kathleen answered all my questions promptly and made the rental process very easy. She even had the property decorated for the holiday season! Thanks for the memories Kathleen! Beautiful home in a great location. Didn’t seem like anyone else was around and it felt like home. Very cozy inside with the great pellet stove very spacious and beautiful home. Without a doubt will be back. My girlfriends and I had a wonderful time staying in Kathleen’s place. It is spacious enough, yet super cozy. We had everything we needed and Kathleen is great. We will definitely be back! Spent the weekend with my sisters & sister-in-laws for a girls get-a-way weekend at Hidden Valley. Our townhouse was great. It accommodated us all nicely. It was very clean & roomy. We rented a couple movies but couldn't get the DVD to work. We called the owner Kathleen, and as she lives nearby, she came right over and got it working for us. Thanks Kathleen. We had a great time. Home is in the Laurel Highlands, with many sites, including Falling Water (Frank Lloyd Wright), Flight 93 Memorial, just minutes to multiple state parks with fishing, swimming, boat rentals, hiking trails, and more.